This Greek chickpea salad is healthy and a filling dish on its own. It is packed with protein from the chickpeas and quinoa and full of vitamins from the herbs, vegetables and salad dressing. I always cook the chickpeas from scratch but if you do not have the time for this, you can either cook them when you have time, separate them into batches and freeze them or you can buy canned chickpeas, which will reduce the time of preparation considerably. I usually use chickpeas without any skin on. In case you cannot find any with the skin removed, after soaking them overnight, change the water and rub them with your hands. The skins will float away when discarding the water. Continue this procedure until you have removed most of them. You can prepare the chickpeas and quinoa ahead and add your extra protein depending on what you like. I have added tuna but you can replace it with ham, smoked turkey, grilled chicken, feta or even hard boiled eggs. If you want your salad vegan, just leave out these extras and add your favourite vegetables. It is also a wonderful side dish to fish or other grilled meat. Τhe vegan option still has a lot of protein from the chickpeas, quinoa and tahini and is also a very healthy meal. 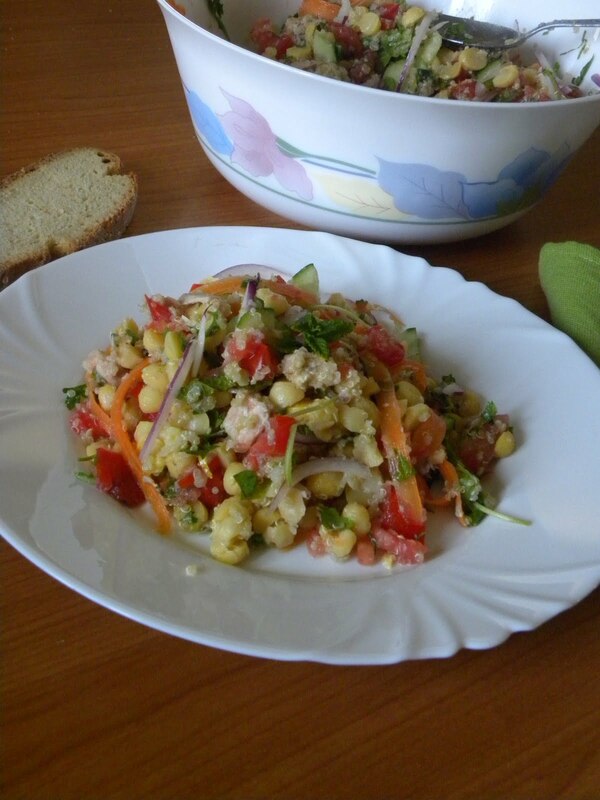 We love eating chickpea salads and I have made it in many ways. When we are fasting I just add a simple Vegan Tahini Sauce and when we are not, I make it with yoghurt. The Tahini sauce with Yoghurt becomes a thick spread and looks like mayonnaise. It can be served as an appetizer, as a dip for raw vegetables or as a spread, on bread. To use this spread as a sauce, mix it in the salad as it is or if you want it more runny, you can just dilute it with some water, before adding it to the salad. The salad is full of aroma from the lemon zest and mint, which match perfectly with the other ingredients and makes a very refreshing meal during summer. It stores well in the refrigerator up to 2 – 3 days and it packs well for lunch boxes or picknicks. Next day change the water in the bowl and rub them with your hands to remove the skin. Drain, add fresh water and boil. Remove foam with a slotted ladle and when no more is visible, drain and add fresh water. Bring to a boil, add salt and cook for about 1 hour or until they are soft. Drain and set aside to cool. Place quinoa in a large bowl and cover with water. Let it stand for five minutes and rinse well. In a salted pot of boiling water or broth, cook quinoa for 20 minutes, remove from the heat and leave it in the pan until it cools. Vegan Tahini Sauce: In a smaller bowl add the tahini and mix with hot water to make a paste. Add the olive oil, zest and lemon juice and mix to combine. Add salt, pepper and oregano and mix the salad dressing. Tahini & Greek Yoghurt Sauce: Put all the ingredients in a food processor and puree until thick and smooth. To use as a dressing, take the quantity you want and add some water, a tablespoon at a time, to make it thinner and have the consistency of a dressing. Pour the sauce over the salad and mix well. Refrigerate for half an hour for the flavours to develop and serve. This healthy Greek chickpea salad is a filling dish on its own, packed with protein from the chickpeas, quinoa and tuna and full of vitamins from the herbs, vegetables and salad dressing. Healthy, filling and delicious…I wouldn’t have missed the meat here at all. A perfect vegetarian dish, Ivy.